Donghoon Lee, a graduate student in civil and environmental engineering, will discuss his research with Paul Block, who received a 2016 GHI Seed Grant to investigate how better flood prediction can support advanced disaster preparedness and identify public health risks. Among all natural hazards, flood catastrophes consistently have the greatest impact on society. Most floods occur in developing regions and tropical regions where the consequences for public health are substantial. Using scientific forecasts on disaster management has been highlighted, but there are limited predictive factors and forecasting techniques for specific health risks, and equally limited capacity to develop infrastructures for such a health forecasting system, particularly in developing countries. 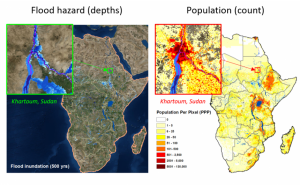 This presentation will focus on the development of a global flood prediction model to support disaster preparedness and managements for potential flood and flood-induced public health risks. Advanced long-term flood forecasts and early warning outputs from the model will contribute to developing practical pre-disaster actions and policies under current management systems. The Global Health Tuesday seminar series hosts researchers and practitioners from the University of Wisconsin-Madison and across the world. The speakers showcase the complexity of global health challenges and the many kinds of expertise needed to address them. By sharing their experiences with the campus and Madison communities, these guests provide insights into global health, encourage conversation, and help connect colleagues locally and globally.